If you want to get noticed in the crowded fashio world, marketing is key. Basically, there are two type of marketeers, the ones that prefer to spend a lot of money on add campaigns, commercials and the likes, and the other type, that prefers smart-marketing: gathering attention for free. Schutrups, a Dutch shoe store clearly is the latter type. In Europe, this summer is a Sport summer: European Championship Soccer, later on the Olympics and right now, the famous Tour de France! This last event obviously inspired the Schutrups to come up with a novelty. 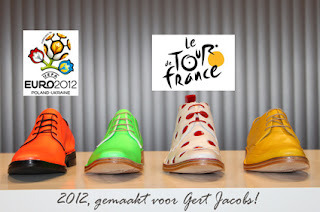 They commissioned a set of Tour-de-France inspired shoes with Kops-schoenen, one of the few remaining shoefactories, that once were a big source of employment around the Dutch city of Tilburg. Together with a designer of Kopsschoenen, Schutrups spawned a series dedicated to the worlds most famous cycling tournament. The shoes are designed around the well-known shirtcolour that can be earned in the tournament, the Green, Yellow, Orange and of course the polka-dot shirt for the mountains classification. Shutrups commisioned them for the Dutch former cyclist and co-presenter on a Tour de France TV program, Tour du jour. And in case you wonder: yes, he wore them on TV as well. Kops, happened to be the only company able to design and produce 11 of these shoes within the 10-day window between idea and start of the tour de France. They have received quite some attention from different media with the production of these shoes. They are not cheap (400 euro's a pair) but its definately reasonable if you take in account that each pair takes several hours of hand-production. And for that price, you get not only a pair of wonderful, handcrafted shoes, but also a pair of conversation starters. They sure leave an impresion! 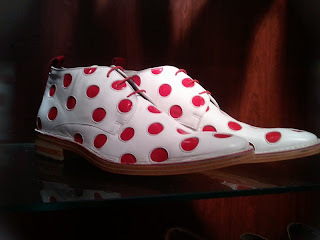 I guess you meant polka-dot shoe?